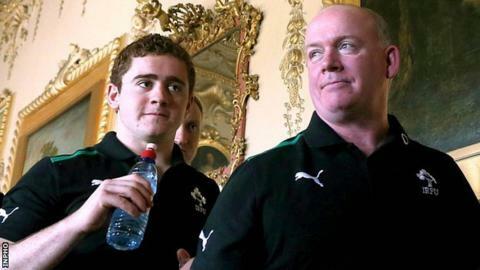 Ulster fly-half Paddy Jackson believes his chastening Heineken Cup final experience last year has prepared him for his Ireland debut in Sunday's Six Nations clash with Scotland. Jackson was a surprise inclusion ahead of 127-times capped Ronan O'Gara for the Murrayfield game. The move arguably represents the biggest call of Declan Kidney's Ireland stint but Jackson remains unruffled. "I've come a long way since the Heineken Cup final," said Jackson, 21. "I'll be more used to dealing with nerves and don't think I'll be as nervous," he said. Parallels can be drawn with last May's Heineken Cup final, when Jackson was named at fly-half instead of the more experienced Ian Humphreys. That match did not go well for the youngster as Leinster strolled to a 42-14 victory over their Irish rivals. Jackson has been in impressive form for Ulster this season, although the presence of South Africa star Ruan Pienaar has taken some of the half-back pressure off him. "After the Heineken Cup final I forgot about rugby for a while," Jackson added. "I took a break, came back for pre-season and knuckled down. "I'm excited and looking forward to getting out there against Scotland. I was very surprised to be selected. I had butterflies in my stomach, but then I calmed down. "I'm really glad I've got my chance now. This will be the biggest game I've played in." Jackson will perform the kicking duties against Scotland, even though Pienaar usually fills the role for Ulster. "I kicked for Ulster at the start of the season and felt as though it was a matter of keeping Ruan at bay for as long as possible," Jackson said. "He's one of the best kickers in the world and has 10 or 15 metres on me. "I sat down with (Ulster coach) Mark Anscombe and he said he wanted Ruan to kick. There's not much you can do about that, but I've still been training most days." Jonathan Sexton's hamstring injury has given Jackson the chance to prove he belongs in the Test arena and ambition prevents him from being satisfied by performing a supporting role. "We're all competitive rugby players and everyone wants the starting jersey," he said. "I know I'm young and coming through, but eventually that's where I want to get to." Jackson is joined in the starting XV by another uncapped Ulsterman in Luke Marshall, who replaces foot injury victim Gordon D'Arcy at inside centre. Read more on Six Nations 2013: Home comfort for Scotland?